• Finally! Jimmy has a codename…but is he a hero or a villain? This issue picks up right where last issue left off, with Daken about to murder his alternate-universe brother, Jimmy Hudson, who is now going by the name Poison because he’s also the last surviving Poison from the Poison X/Venomized X-over. If there’s one thing Wolverines love, it’s killing their own family members. 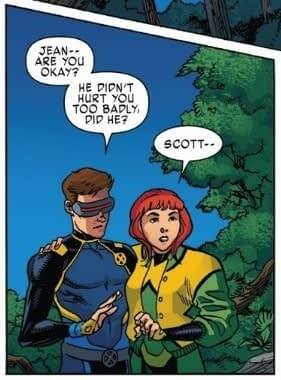 Cyclops and the other time-displaced teenage X-Men plus Bloodstorm think that Jimmy can be saved. Everyone discusses these differences like the calm and rational adults they are, which is to say a brouhaha occurs. Bloodstorm understands what Jimmy is going through because she’s a vampire. Jean Grey also understands because she too spent time as a poison during the crossover. Cyclops mostly just wants to fret over Jean. Jimmy escapes. Jean lectures Daken and wants to know if Magneto really sent him to kill Jimmy. Daken dares Jean to read his mind, and when she does, psychic backlash blasts the team, allowing Daken a chance to escape. Daken chases down Jimmy, who is talking to himself while running through the forest, providing X-position about the Poisons (where was all of this X-position during that actual crossover?!). 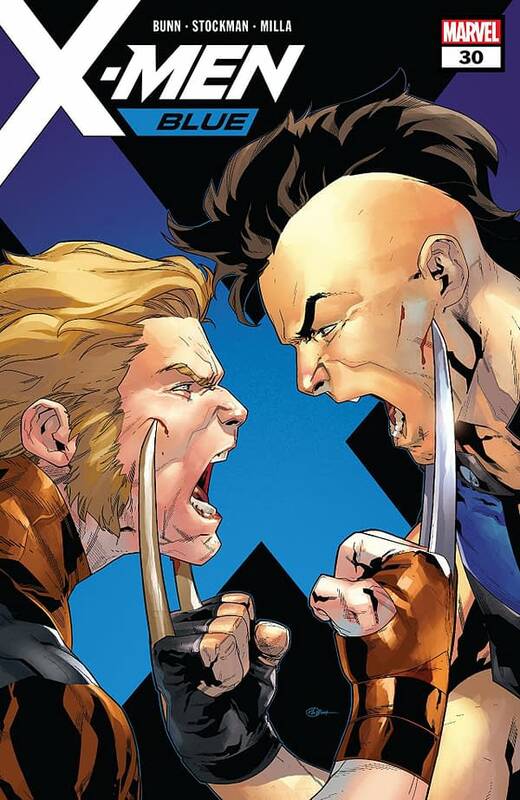 Daken catches up, and it’s time for an epic Wolverine vs. Wolverine battle. That goes on for a few pages until Iceman intervenes, encasing both Wolverine in ice to stop them. Jean arrives and reads Jimmy’s mind, determining that he’s still Jimmy, not a poison. She takes him for a walk through the woods and gives him a pep talk, then tells him to go spend some time getting to know himself again. This comic is ending in September anyway, so he could get a jump on looking for a new ongoing. Jean returns to the other X-Men to interrogate Daken again. 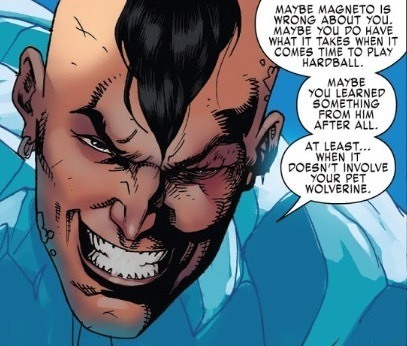 Daken says that Magneto is fed up with everything that’s been going on in this comic and has decided to slide further down the path toward villainy. He’s taking out all his enemies, and Emma Frost is first on the list. The issue ends there. The previous storyline was the culmination of a lot of stuff that’s been going on in this series. X-Men Blue is ending in September (along with X-Men Gold), so the next few months will likely be spent wrapping some things up and getting ready for the Extermination X-0ver event, which seems to be centered around the time-displaced X-Men and the damage they’ve caused to the timeline, and which will almost certainly be followed by an Uncanny X-Men reboot. It’s almost a shame though because being allowed to run for 30 issues without a stupid reboot means X-Men Blue has built up a lot of momentum, but the Marvel model requires every book to start over from scratch just when things are starting to get really good. Want to know more about Daken? Why? Oh, okay fine. All of Dark Wolverine is on Marvel Unlimited. And while you’re there, go back and read some old Uncanny X-Men since X-Men Blue isn’t long for this world.